I am an advocate and person living with Sickle Cell disease. Fortunately, I am educated and have the ability to find a job unlike many of the persons living with sickle cell disease I meet through my advocacy activities. Beyond online advocacy, we go on outreaches to remote villages in the Ashanti region of Ghana. We find that a lot more effort needs to be put into creating awareness about sickle cell disease. Radio is great, but unfortunately few people pay attention to us on radio as they prefer music and entertainment. A large number of the people we meet are totally ignorant or simply misinformed about sickle cell disease. A colleague teacher with a science background told me I cannot have sickle cell crises after 35 years. A teacher, an educated person has this myth so how do we expect an uneducated farmer to understand sickle cell if we do not go and explain it to him? A bank manager I know, divorced his wife because he had no history of sickle cell disease in his family and would not accept the responsibility of caring for their baby who has sickle cell disease. His reaction obviously was due to ignorance, but if these are the educated what are we to expect of illiterates? Here is what to expect. Meet “Prof”, a 19 year old junior high school (JHS) graduate who lives in Assin Ayaase in the Assin South district of the central region with his relatives. Prof is an orphan who graduated JHS two years ago but cannot pursue further education due to financial constraints. He does not receive routine medical care despite being a known sickle cell disease patient because he does not have health insurance and his family simply cannot afford it. Prof came to our attention in November last year through one our members, Lydia, a nurse. He was severely anaemic at the time, but could not receive care due to poverty. 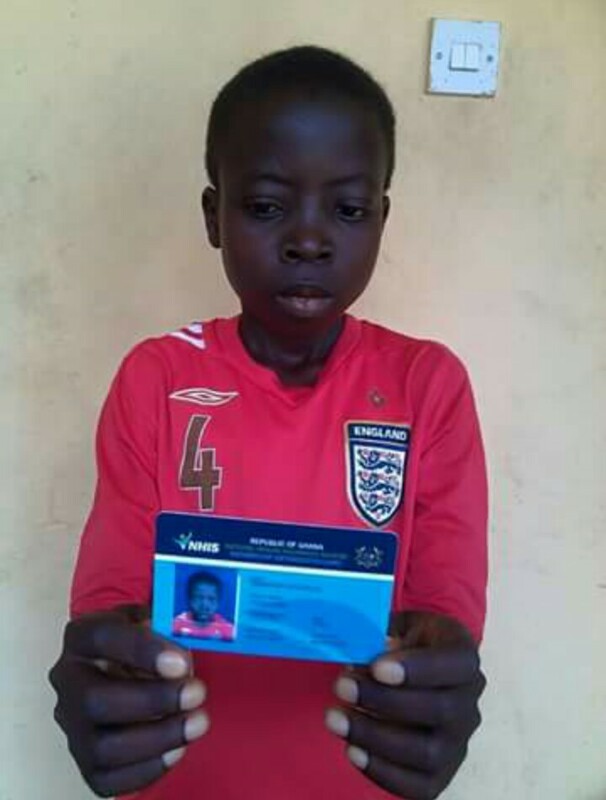 Lydia promptly got him registered for health insurance to ensure that he could begin to receive basic care. In January this year, during a routine check up he was found to have an enlarged spleen and severe anaemia with Hb of 4.6. We were informed that he needed surgery for his spleen. 3 days later he collapsed and was rushed to a nearby clinic which referred him the Abura Dunkwa district hospital where his Hb was found to be 3 and he was given 2 units of blood and further referred immediately to the Cape Coast regional hospital for surgery for his spleen. We put out an urgent appeal for funds on our Facebook page but it did not yield much because people wanted to know the cost of surgery before donating. His family returned him to the village because of lack of funds and because his grandmother strongly believes that sickle cell disease is spiritual. After about a week, we visited him at home. He was in a very poor state, and unable to come out to see us due to the weather at the time. We offered to pay for him upfront and hopefully get donations later but his grand mother still insists that his sickness is spiritual and is currently using herbal medication to treat him despite our advice about the seriousness of his condition. We have no idea how to persuade them to let us take him to the Cape Coast Regional hospital for further treatment. Prof’s story is not unique. There are several people living with sickle cell disease in Ghana who are not receiving medical care due to ignorance, superstition, religion and poverty. Some, especially those in rural areas are so poor they can barely afford two meals a day. Our advice on balanced diet and healthy eating is a joke to them. Some cannot even afford our most basic routine medication, folic acid and simply cannot afford to register for health insurance. This is our reality. Advocacy is good, but if we can’t empower people to use the information we give, what good have we done. If we can’t work together to provide life saving surgery for one of us, what good is all this? If our patients cannot obtain adequate education and employment how can they maintain good health? We as advocates need to partner with entrepreneurs to offer some training for our clients so they can earn a minimum income to access proper health care. It is not too late for you to act. Support a sickle cell advocacy group with your skills or finances so we can make an impact in the lives of our clients. We are still persuading Prof’s family but I wonder if we would be in this situation if we had money to transfer him to Cape Coast when he was in critical condition? This failure is on all of us. Submitted by : Nana Kofi Acheamfour. Nana is an advocate and person living with sickle cell disease. He is a teacher and founder of Tame Sickle Cell. Nana is very passionate about sickle cell education and the welfare of persons living with Sickle Cell Disease. Contact us for information on how tho donate to Tame Sickle Cell and other Sickle Cell advocacy groups in Ghana. This entry was posted in Blog and tagged advocacy, Ghana, health, sickle cell disease. Bookmark the permalink.